Like clockwork, as soon as Spring is in the air, there’s only one thing on my mind. Baking galettes and while we’re at it, tons of them. How not to love syrupy fruit baked in the flakiest pastry? Or the smell of butter and roasted vegetables spiced with herbs? It was love at first bite when I tried my first galette back in pastry school. They are one of the easiest meals to make. A blank canvas ready to be filled with your favourite ingredients. One of those recipes that you can easily be drawn to over and over again. Versatile and simple, galettes have comfort food written all over them, and this makes it hands down, one of my favourite things to bake. If you’ve been following the blog for a while, you know that galettes and I go way back. Especially during the summer, when farmers markets around our home start bringing out the juiciest fruit and freshly picked vegetables from the Niagara region. Fragrant berries and peaches, that I usually spice with cinnamon, cardamom and vanilla. I can’t wait for market season to start so I can come back home with baskets full of Ontario grown produce, and spend an afternoon baking away. 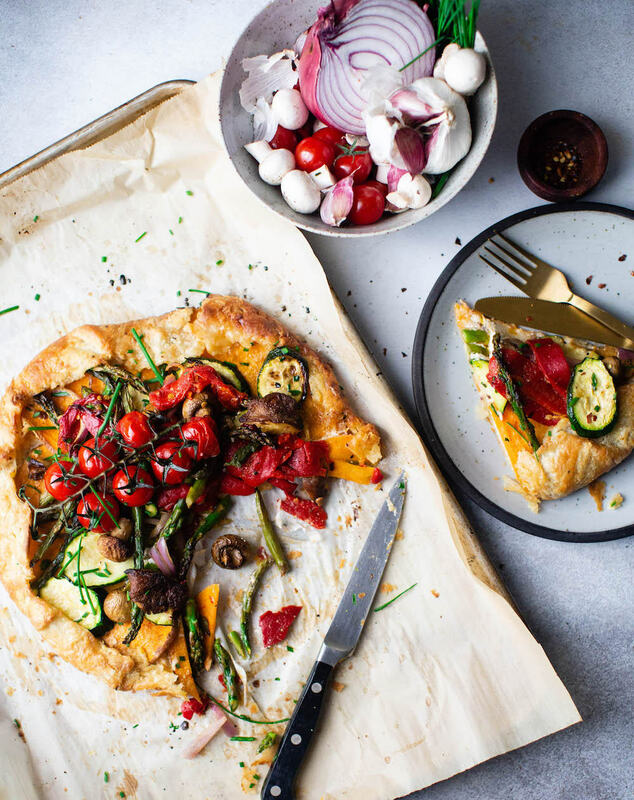 For today, I chose my favourite spring vegetables to bring you a galette that can be made for a weekend brunch, lunch or dinner. Pair it with a green salad and you are good to go! One word. Butter! Specifically, very cold butter. You want the butter to be cold until the moment the galette goes into the oven. This is what gives you its flaky and tender crumb. One that is super easy to work with, and doesn’t fall apart when shaping it. Because let’s be real, nothing is more disheartening when baking than pastry breaking when being rolled. If you can chill the bowl where the pastry’s ingredients are going to be mixed in, even better. This step will also help to make your galette’s pastry a success. Fruit galettes, usually call for cornstarch to thicken the juice released by the fruit while baking. For a savoury galette, a thin layer of creamy sauce is needed. Not only will the sauce add flavour to the vegetables, but it will also keep the pastry flaky and the juices in. The sauce enhances the flavour of each vegetable, and if there’s cheese in it, you know that can only mean one thing. 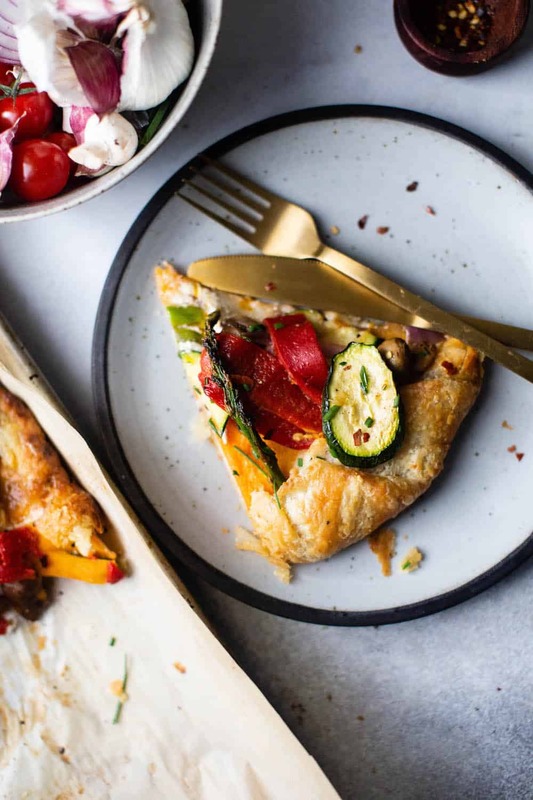 Your galette will be that dish that your friends and family will be asking you to make ALL the time. 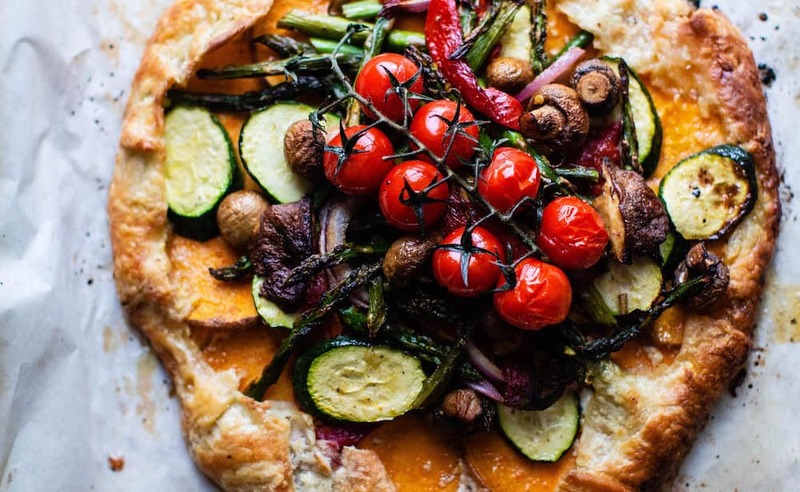 Nothing says Spring like asparagus and zucchini, and when paired with red onions, a bit of chilli flakes, fresh button mushrooms, thinly sliced sweet potatoes and fresh thyme, it results in galette with so many layers of flavour. Having said that, use this recipe as a guideline, and fell free to add the vegetables you have on hand. Portobello mushrooms, tomatoes, basil and goat cheese will be coming next to the blog. For bow, I hope you love this one as much as we did at home. Whisk the flour, salt and pepper together in a large bowl. Place a box grater over the bowl and grate the butter on the large holes. Gently toss the gated butter in the flour to distribute it evenly. 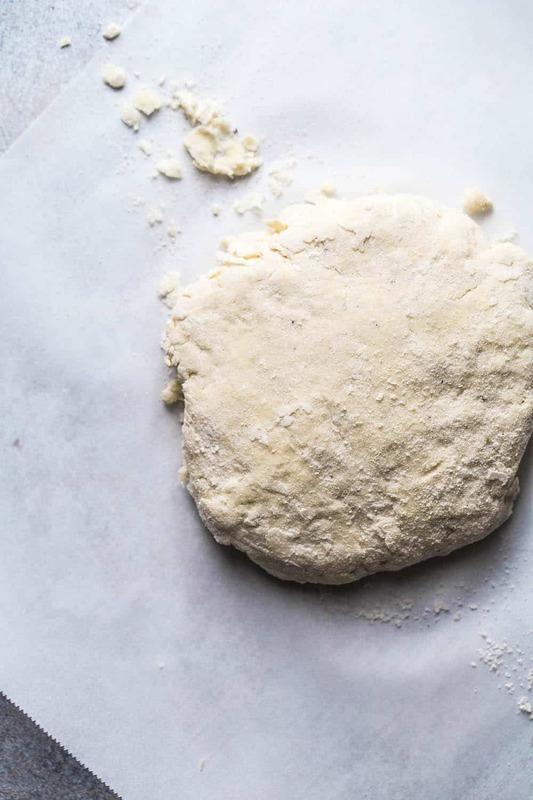 Scrape the dough onto a work surface and knead gently until the dough comes together (about 2 minutes) Shape it into a disk, wrap it in plastic and refrigerate for an hour. 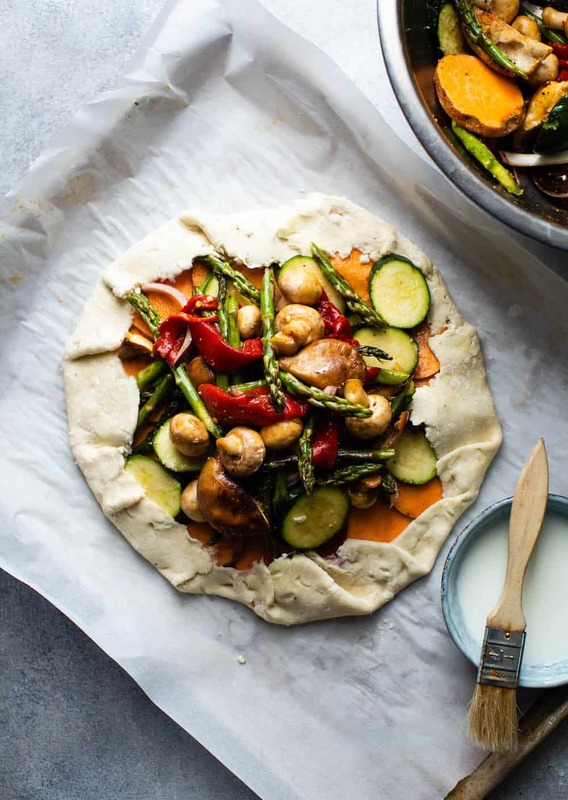 While the dough is in the fridge, place the potatoes, zucchini, mushrooms asparagus, red onion and red peppers in a large bowl. Add the salt, pepper, thyme leaves and olive oil. Set aside. Preheat the oven at 450F. In a small bowl, stir the sour cream and parmesan cheese. Take the dough out of the fridge, and spread the cream mixture evenly over the dough, leaving a 1 1/2 -inch uncover edge all around. Scatter the vegetable mixture on the cream mixture. 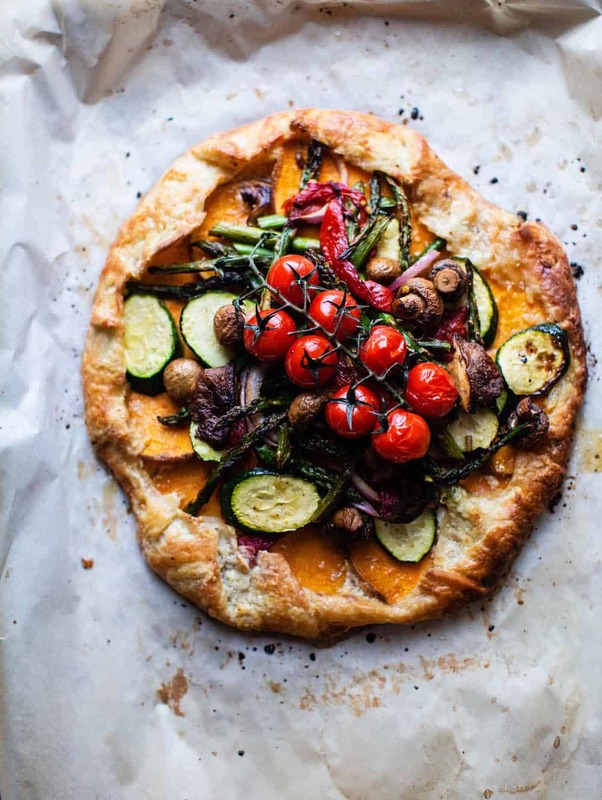 Fold the edge pf the pastry up and over the vegetables, to create a folded-over border and an exposed center. Top with the mini vine tomatoes. Lightly brush the edge of the dough with milk, being careful not to let any milk drip beneath the dough. 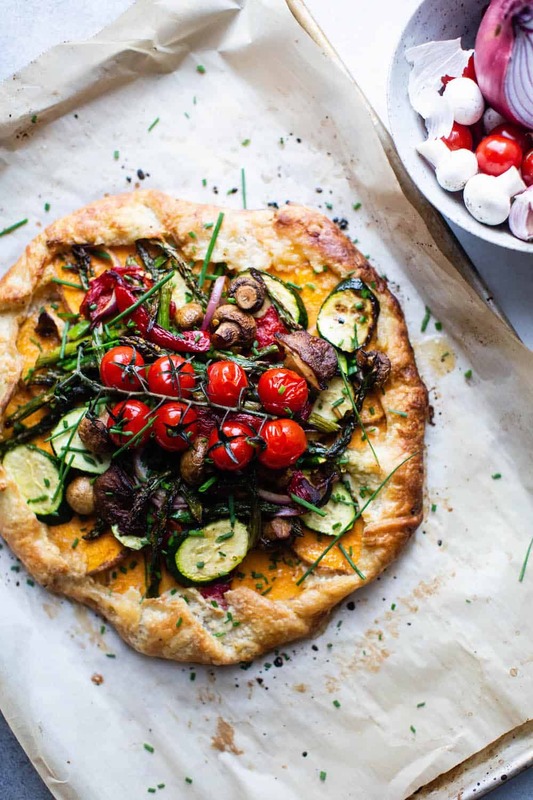 Bake the galette for 25 minutes, until the pastry is lightly browned and the vegetables are tender. Let the galette Cool slightly on the baking sheet. Serve warm or at room temperature. Enjoy! I made this exactly as you instructed and it was delicious. I’m not very good with making pie crusts or doughy items; I followed your instructions to freeze the butter and grate it, This made it so much easier to handle the dough. It was a perfect meal for my vegetarian daughter. Thank you for sharing this recipe. Mary I am so glad you liked it! 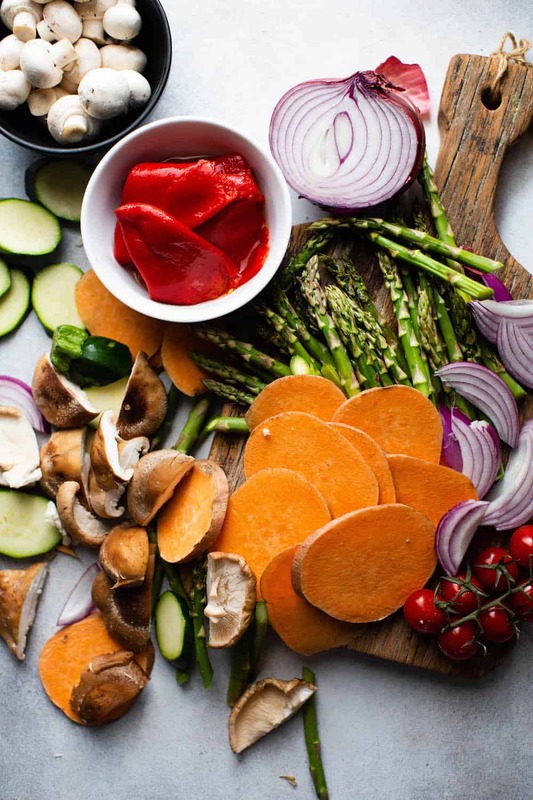 feel free to use the vegetables you have on hand as well! So happy you made it Holly! !